The Peaceful Streets Project and her members have long been targets of the criminal cops of the Austin Police Department. Ever since the illegal arrest of founder Antonio Buehler on New Year’s Day 2012, the Austin Police Department, with the help and support of prosecutors, have attempted to bring Buehler and the Peaceful Streets Project down. Buehler has been arrested a half dozen times, while other members of the Peaceful Streets Project have been arrested an additional half dozen times — all for daring to try to hold the police accountable. Fortunately for the Peaceful Streets Project, we have had good representation for each bogus charge brought forth, and we have been cleared of all charges. Unfortunately for us, the police have gone much further than just arresting us on the streets. For example, they had previously tried to have us labeled as domestic extremist threats, they have lobbied the District Attorney to attempt to indict us on trumped up felony charges, and they continue to slander us in the media. And these actions haven’t been led by a few “bad apples” in the department–they have been directed and led by the Hubert Arturo “Art” Acevedo, the Chief of Police. Most recently, after the illegal arrest of Antonio Buehler and Mike Smith on August 2, 2015, Hubert Acevedo and his minions floated the lie that Buehler had gotten in the officers’ faces which would supposedly give the cops enough probable cause to arrest Buehler for Interference with Public Duties. However, there are two problems with such an assertion. First, all the video evidence that exists proves that the cops lied. Buehler never got in the cops’ faces. Instead, Buehler stood still as the police officers repeatedly approached him, violating his space, and intimidating and threatening him for exercising his First Amendment rights. In all, there are a half dozen videos that were taken by the Peaceful Streets Project, and HALO video and cell video taken by the Austin Police Department that proves that the cops lied. Second, irrespective of guilt or innocence, the Chief of Police nor any other police officer should never comment publicly in a manner which could suggest guilt against a criminal defendant. 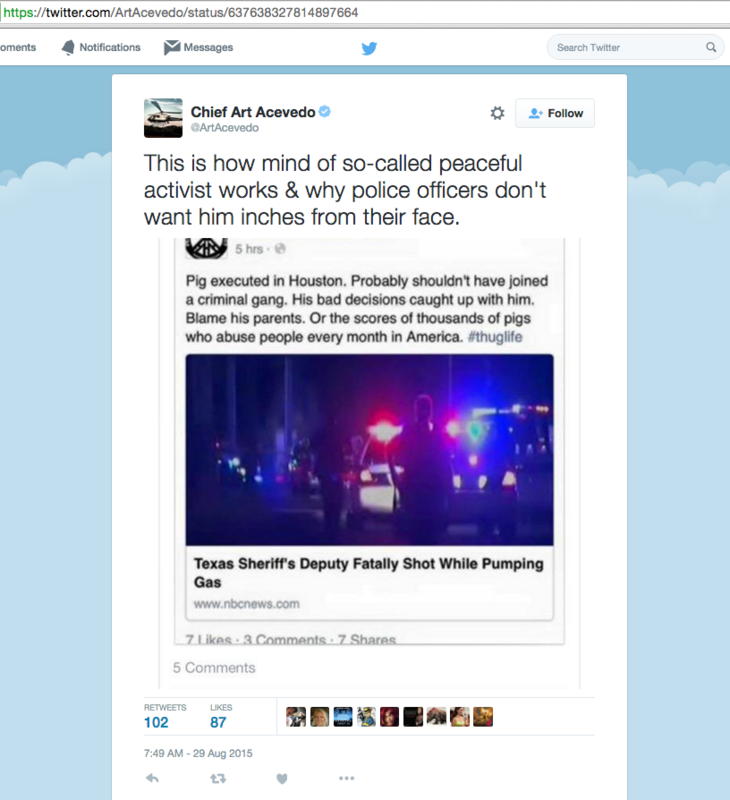 On August 29, 2015, Hubert Acevedo violated basic decency and professional standards in sending out a tweet which suggested that Buehler gets in the faces of police officers when filming them. Through his unprofessional actions, Hubert Acevedo brought discredit to an already corrupt department and profession. Buehler filed the official complaint with the Office of the Police Monitor (OPM) on January 20, 2016. As with all complaints, we fully expect this one to be papered over. We post the contents of the complaint below, publicly, as a service to the people who the system does not represent. We will provide an update when Hubert Acevedo or one of his minions determines that he did not violate policy. I am a member of the Peaceful Streets Project. We are a grassroots community activist organization that attempts to change culture so that police do not abuse people or commit crimes, and so that members of the public will hold the police accountable. One of our primary activities as an organization is filming the police (“cop watch”) while they are performing their duties in public. On the night of August 1, 2015, I joined a group of Peaceful Streets Project volunteers downtown to cop watch in the Sixth Street area. During that cop watch, I was harassed on multiple occasions for filming the police, and ultimately illegally arrested for exercising my First Amendment rights. More specifically, I was arrested by SGT Randy Dear, Officer Aljoe Garibay, and other police officers for Interference with Public Duties while I legally stood in a public street filming the police. SGT Dear had approached me in the moments leading up to the arrest, and at previous times in the night, getting so close that he placed his face in front of my camera. At no point in any of my interactions with SGT Dear did I ever move my body or my arm toward him to place a camera in his face. Every single time that my camera was in close proximity to his face he had moved his body and face toward my stationary or retreating camera. In the days following the arrest we released multiple videos that proved that the claims made by Officer Aljoe Garibay in the probable cause affidavit, and by the other officers in their supplementary reports, were abject lies. It is apparent to even the most inattentive person that the only reason why a camera was ever in close proximity to SGT Dear or any other police officer’s face was because they approached me and stuck their face in my camera. I will be able to transfer those videos to a hard drive during my interview with IA/OPM. Furthermore, the HALO cameras that the Austin Police operates and controls also showed that the only time that my camera ever got close to any police officer’s face was when the police officer approached me while I stood my ground. 1. Hubert Acevedo violated APD Policies 301.1, 301.2 by using his position and reach to perpetuate false criminal allegations against me. This was discriminatory in nature because he does not use social media to suggest other criminal defendants are guilty of the crimes they are charged with, but has repeatedly targeted me in his social media posts. 2. Through his actions, Hubert Acevedo violated APD Policy 301.3, further eroding APD’s standing with the community. 3. Hubert Acevedo violated APD Policy 455.5(b)1 by using Twitter to make comments suggesting that I was guilty of the fraudulent charges levied against me on August 2, 2015. At the time he made these comments, the charges were still pending against me. 4. Hubert Acevedo violated APD Policy 900.3.1 by perpetuating the lie that I get within inches of police officers’ faces. If Hubert claims that he was ignorant of the ample evidence that proves that I wasn’t getting within inches of officers’ faces then he is either lying or profoundly incompetent. 5. Hubert Acevedo also violated APD policy 900.3.2. Hubert’s position as Chief coupled with his misuse of social media to attack the character of someone who was wrongfully arrested by his police officers is in every way a despicable act. Even if I were legally arrested, which I wasn’t, it would have still been improper for him to mischaracterize my actions in a way that could potentially influence a jury pool. This is a formal complaint. This incident presents policy violations that warrant closer examination to identify, address and correct officer conduct. I request that Anthony Hipolito not be staffed on this complaint given his prior role misleading the media regarding my now infamous New Year’s Day 2012 arrest. Thanks for the comment. We know that the complaints will go nowhere. We are just documenting that.